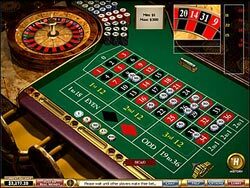 Roulette is one of the oldest casino games originating in France in the 1600s. It remains one of the most popular casino games both in real life and in popular culture. Almost any image of movie scene involving a casino will feature the roulette wheel and table. Roulette has a much slower pace then a game like craps, but is nonetheless just as exciting and fun to play. The roulette dealer, also referred to as the "croupier" spins the roulette wheel and manages the wagers and payouts for up to eight players. The European roulette wheel has 37 slots representing numbers 0 through 36. American roulette wheels have two 0 and a total of 38 slots. Each player will buy in with different colored chips so that bets don't get mixed up. They can then be taken to the cashier to be changed for money. To play roulette you place your bet or bets on any numbers and when all the bets are place, the croupier will spin the wheel and launch the ball. When they call "no more bets" no one may place or change any bets. Once the croupier places the "dolly" or marker on the winning number, and clears all the losing bets players my place new bets while the croupier pays out the winners. The "en prison" rule is found in some casinos, but not all. When the result is 0, on even money bets, the player may be allowed to take back half their bet or leave the whole bet in for another spin. If the result is zero again, the whole bet is lost. The "la partage" rule is similar to the "en prison" rule, except the player looses half their bet and does not have the option to leave the bet for another spin. This refers to bets like red/black, high/low, odd/even and applies when the result is 0. Both rules cuts the house advantage on even money bets in half; a bit less on double 0 tables. Most roulette tables follow the following payout rules. The object of the game is to predict which number the ball will land on, in a roulette wheel. This is mostly dependent on luck, but many have tried using specific roulette systems or methods. Some will bet on a certain number believing it is "due" to come up. This is a flawed system however, because with every spin the ball will always have the same odds to land on any specific number.